On Friday, Mar. 6, the primary and backup crews of the upcoming Expedition 43 to the International Space Station (ISS) showed their readiness for the mission during a press conference in Star City, near Moscow, Russia. 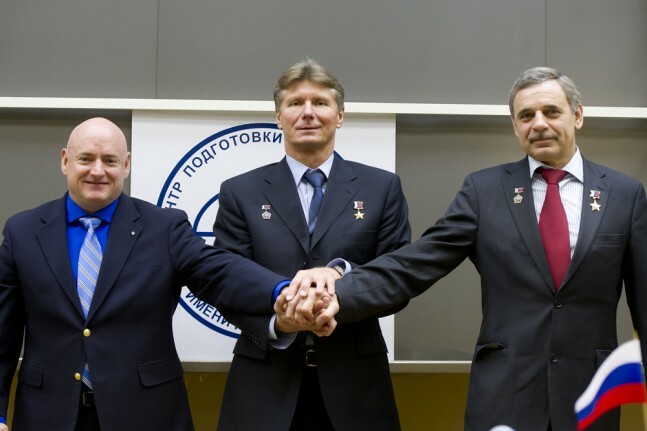 The primary crew (Russian cosmonauts Gennady Padalka, Mikhail Kornienko, and U.S. astronaut Scott Kelly) and the backup crew (Russian cosmonauts Alexei Ovchinin, Sergei Volkov, and NASA astronaut Jeffrey Williams) will proceed to the final stage of preparations at the Baikonur cosmodrome in Kazakhstan. Kelly and Kornienko will stay on the ISS for one year, what will allow studying the effect of long-term human presence in microgravity. While Scott Kelly is in space, his twin brother, Mark, will duplicate this experiment on Earth; carrying out the same tests and performing the same tasks in order to compare the data collected under the influence of gravity versus its absence. The press conference of the flight’s participants was held after the examination drills. The complex examination drills of the ISS long-time expedition primary and backup crews have been completed at the Cosmonaut Training Center. According to the results of the two examination days, the Commission has highly assessed the preparation of all crew members, thus confirming their readiness to work in the ISS. During the drill, the flight’s participants had to recognize the emergency situations, simulated by the Cosmonaut Training Center’s instructors, and to offer and implement in practice the possible options of their elimination. The crew tested the basic modes of the spacecraft’s flight: launch, autonomous orbital flight, rendezvous and docking with the ISS, as well as undocking and descent from the orbit. 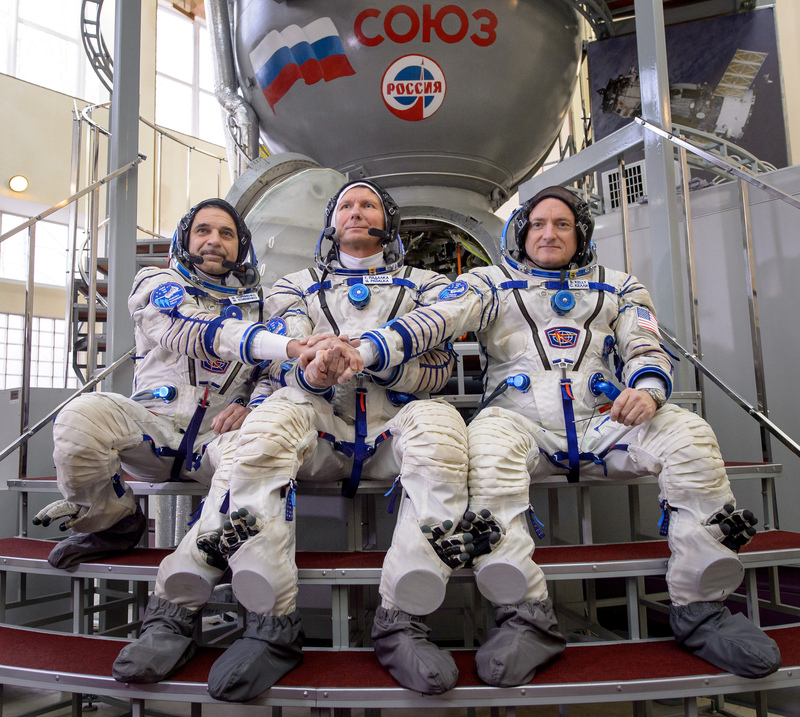 After the successful completion of all stages of the examination by the backup crew, the primary crew completed the examination tasks in the “ISS Russian segment”. The crew members worked out the program of the “typical day in space”, they practiced regular tasks and elimination of emergency situations on board the ISS. At the press conference on Friday, the journalists were mainly interested in the scientific program of the flight. 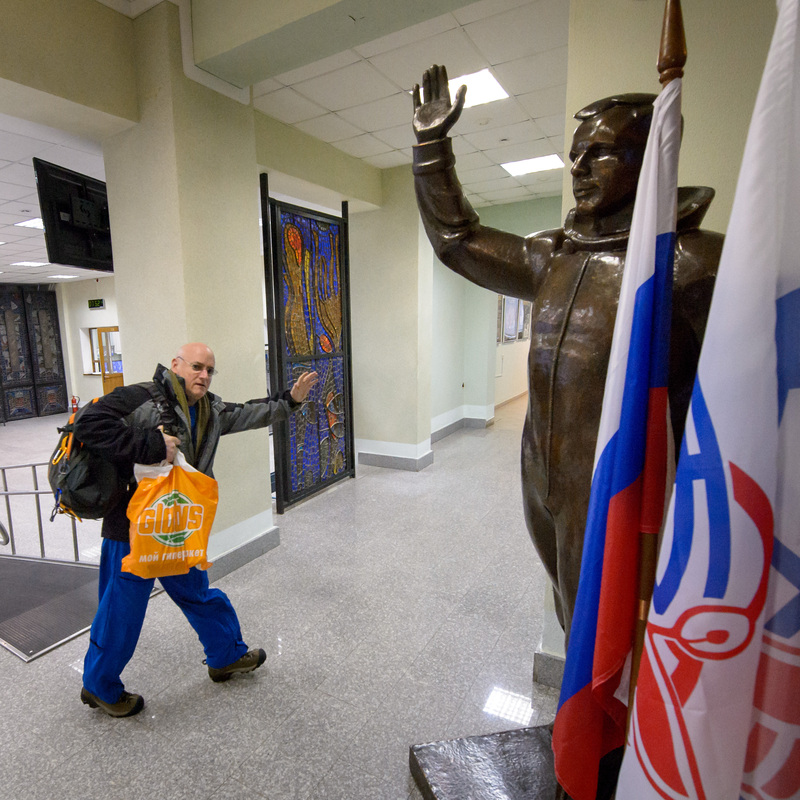 After answering questions, the crews traditionally went to the office of Yuri Gagarin in Zvezdny Gorodok aerospace museum, where they left records in a commemorative book. 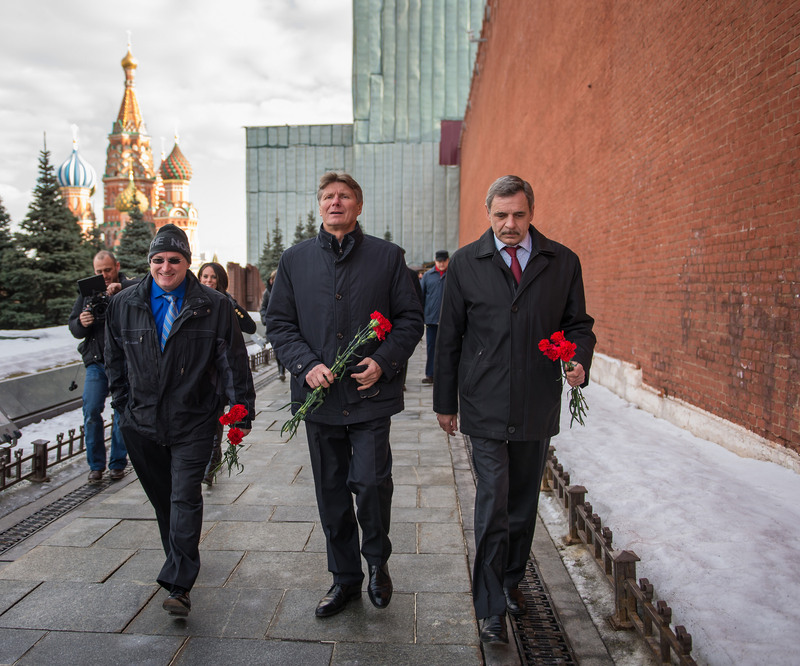 And then, they laid flowers at the Kremlin wall memorial. Now, the flight participants will have the pre-launch preparation directly at Baikonur. Meanwhile, General Designer of RSC Energia for manned space systems Sergei Romanov reported on the progress of preparations for launch of the manned transportation spacecraft Soyuz TMA-16M, and on the readiness of Soyuz TMA-14M for completion of its mission. “Soyuz TMA-16M was assembled in June 2014, passed the full scope of factory check tests and in September was shipped off to Baikonur, where it also passed a full scope of tests per General Designer’s documentation. The spacecraft is currently at the stage of final operations, “Romanov said. He said the launch of Soyuz TMA-16M is notable because the spacecraft will deliver into orbit the participants of a one-year mission, and in September it is going to bring back to Earth the participants of a visiting mission – Sarah Brightman and Andreas Mogensen. RSC Energia First Deputy General Designer Vladimir Soloviev presented the ISS Russian Segment mission plan for the forthcoming period, reported on the results and further plans for conducting science experiments onboard the ISS, and also reported on the readiness of the Russian Segment for carrying out the program of the next expedition. “There are sufficient resources to carry out the ISS-43 program. The control loop is fully functional. Specialists have completed their theoretical training, the onboard and ground operational documentation has been prepared. The hardware and personnel are ready for continuing the expedition,” Soloviev noted. The launch of Soyuz TMA-16M to the ISS is scheduled for Mar. 27, 2015, on Soyuz-FG launch vehicle from the launch pad 1 of the Baikonur launch site.